SAY “Camiguin,” and at once, it conjures up images of the round, luscious, fleshy fruit called lanzones. The volcanic soil on this island off Misamis Oriental has made it possible for the lanzones as well as other fruits and vegetables to thrive lushly in Camiguin. Lanzones-growing is a major source of livelihood for most Camiguingnons. 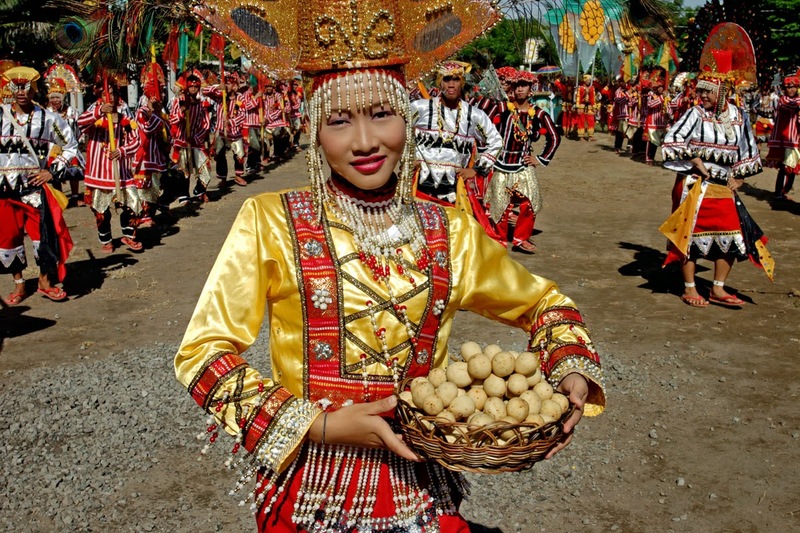 As such, every third week of October, the island erupts into a four-day festival celebrating the small pale-brown balls of golden sweetness, with a street dancing contest, a parade, a trade fair and a beauty pageant. Camiguin Island has beaches including a white sandbar, hot springs, water falls and deep diving spots filled with corals and colorful marine life. It is also rich in religious history and is known for the annual Holy Week pilgrimage called Panaad Festival. Locals and visitors, as part of their religious vow (saad in Cebuano), walk the main circumferential road hugging the island’s coastline, and praying the Stations of the Cross while trekking up the walkway of Mount Vulcan. The friendly and helpful locals speak Cebuano, although indigenous tribes possibly of the original Manobo settlers, still speak their own Kinamiguin dialect. 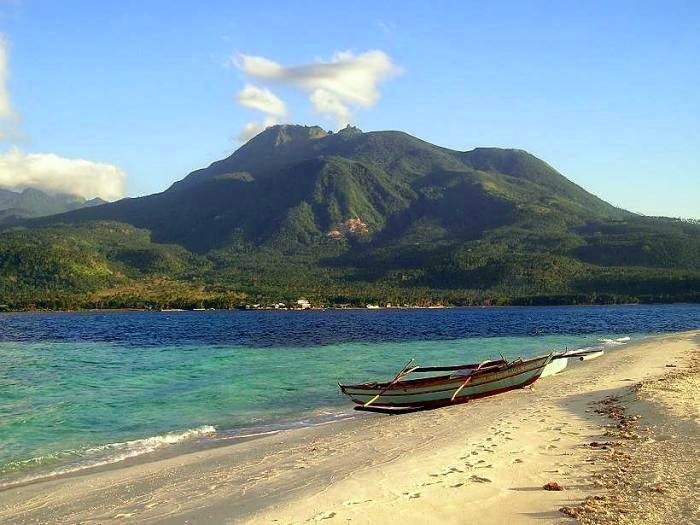 The best time of the year to visit Camiguin is from April to July, during the dry season. In 1871, a massive volcanic eruption occurred in Camiguin, wiping out a 175-year-old Spanish settlement in the municipality of Catarman. What remain are the adobe walls and belfry of Catarman Church (Guiob Church). Inside the ruins is a tiny chapel. Aside from the Catarman Church Ruins, there is also a cross nearby marking the community cemetery, which sank during the 1871 eruption. The area is also a popular dive site. Aside from the beaches, there are also breathtaking waterfalls such as the Katibawasan Falls, which drops from a height of some 80 meters into an icy-cold pool below. The area is also teeming with orchids, ferns and other vegetation. It is about 20-minute ride from the Mambajao town proper. Tuasan Falls in Barangay Mainit, Catarman, cascades from a height of 25 meters. It’s not exactly the easiest spot to go to as this involves some hiking along a cliff to reach a river to the falls. But visitors are rewarded with its pristine beauty and natural rock formations. Being a volcanic island, Camiguin is also rich in hot and cool sulfur springs. There is the Ardent Hot Spring in Barangay Esperanza in Tagdo, about 2 km away from the Mambajao town proper. There are several pools fed by Mount Hibok Hibok but one is just truly hot, making a swim there truly rejuvenating. Food and picnic tables are available onsite. The Macaw Cold Spring in Barangay Tupsan Pequeno, Mahinog town, has a deep smoky-blue color supposedly because it is rich in minerals. You can take a dip—entrance is free—or hike around the area, which has lush vegetation. It’s about 12 km south of Mambajao. Do snorkel or dive in Camiguin as it has a number of rich diverse dive sites, with an abundant marine life. Recommended dive sites are the Jicduf Shoal, Burias Shoal and Kantaan Dive Site (for advanced divers), Mantigue Island, Cabuan Point, to name a few. Feast on the local cuisine and delicacies. 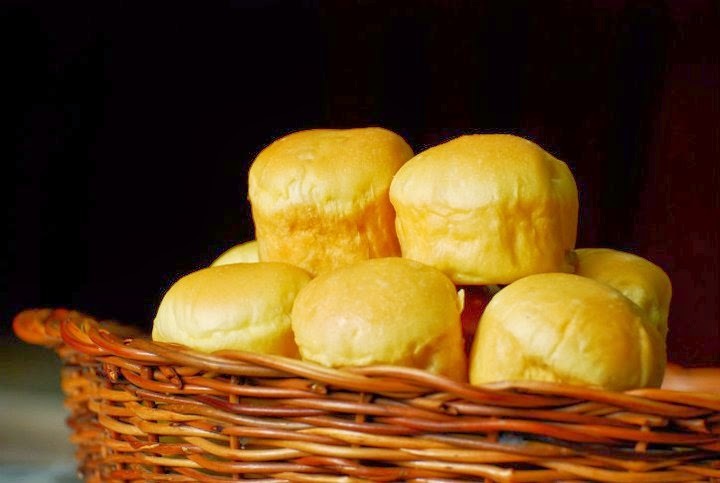 It has grilled chicken; pastel, a soft bun filled with yema (Vjandep Bakeshop, 57 Plaridel Street, Mambajao/T# 088-387-0049); kiping, which is made from sweet potato and served deep-fried with latik (coconut sauce); and an assortment of seafood. There are respectable Italian and Mexican restaurants on the island as well. Check out Little Bridges Taberna Ramada (Anito Barangay Road, Anito) for its muffins and quiches, creamy cheesy lasagna and pizza. If you’re an avid mountaineer, do climb the challenging Mount Hibok-Hibok. Once you reach its peak, you are rewarded with stunning views of Bohol, Cebu and Negros provinces. Casa Roca Inn (http://www.casarocacamiguin.com/) along the National Highway in Naasag, Mambajao, is a full-service bed and breakfast, where the attraction is not only the sea that guests can look out to from their bedroom balconies, but its owners Jim and Evelyn who make every guest feel at home. They also whip up fantastic feasts that will make every tummy sing. The entire house is also available for rent for large groups of families and friends. Golden Sunset Beach Resort (T# 088-387-9163) in Barangay Yumbing, Mambajao, just lies across the famous White Island—you are there in just 10 minutes. Its rooms are spacious and clean, with a salt-water pool that also overlooks a wide expanse of ocean. Getting there: There are flights to Cagayan de Oro City from Manila, Bacolod, Cebu and Davao, or via major carriers. From Cagayan de Oro, take a cab to the Agora Market, where buses go to the town of Balingoan. From there, catch a ferry going to Camiguin. (For more on Camiguin island, check the Facebook page of the Camiguin Tourism Office, or you may call 088-3871-097 local 120, or e-mail: camiguin.tourism@gmail.com).